Study while at the same time gaining practical experience at a company and earn money – this is what our co-op bachelor programme offers. You will become an all-rounder in production technology and the organisation of manufacturing companies – and you can also immerse yourself in the international world of work. … that some of Austria’s biggest companies are partners of this course? 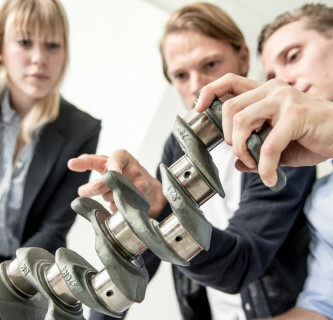 Andritz AG, BMW, Magna, OMV, Siemens, voestalpine – all of them have given our students the opportunity to complete their practical training in an industrial environment. And there are over 100 other renowned companies providing work placement and employment opportunities for our students and graduates. … that our graduate network extends far beyond Austria? Our graduates do not just work in Austria but across the world. Many training companies give students the opportunity to work for one of their subsidiary or partner companies abroad. In this way, the spirit of Production Technology and Organization has spread to China, Japan, Russia and the USA. … that our graduates are successful entrepreneurs? Many of our graduates have already made the jump to self-employment and have founded their own companies. Comprehensive training in the field of industrial engineering and management and ongoing opportunities to apply the knowledge acquired at various partner companies create the ideal conditions for founding a successful start-up. … that our students are also responsible for the exceptional quality of Austrian beer? Modern production technology is about more than just manufacturing machines and vehicles. The Brauunion Österreich brewery is one of our many partner companies and provides students with the opportunity to learn how beer is brewed, bottled and stored and how all the raw materials needed are made available at the right place, at the right time. … that our students can learn first-hand how the blades of an aircraft engine are forged? Close cooperation with industrial companies provides students with the chance to undertake special excursions to production sites that are not usually open to the public. In this way, you will be able to learn about the processes involved, make direct contact with the relevant production specialists and incorporate this expertise into your own professional practice. … that we offer lateral entry? If you have completed a secondary technical school (HTL) in mechanical engineering or operational engineering, you can start straight away in the second or third semester. You will therefore not lose any time. Product optimisation for COMEC-Binder s.l.r.